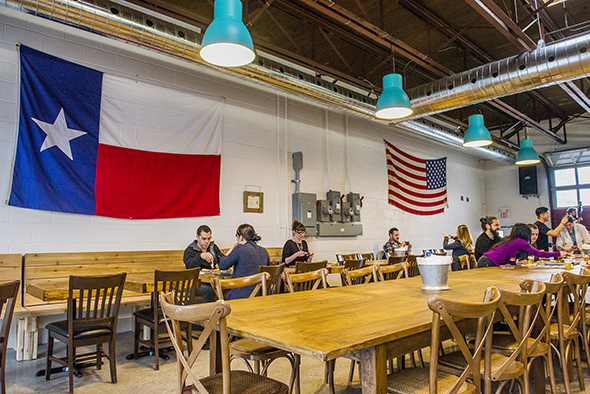 Adamson Barbecue encapsulates every romanticized expectation I have of Texas barbecue joint. 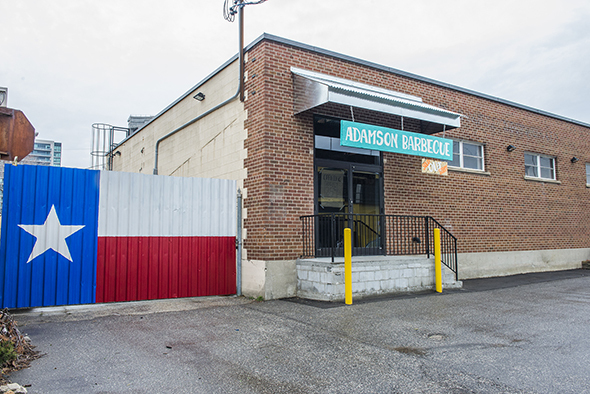 That's probably because Adam Skelly modeled his lunch-only spot - located inside a Leaside-area warehouse - after the famous Franklin Barbecue in Austin. 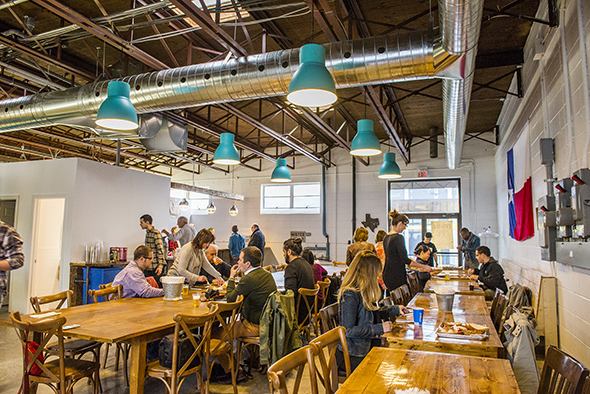 Skelly also owns and operates the Stoke Stack BBQ food truck. 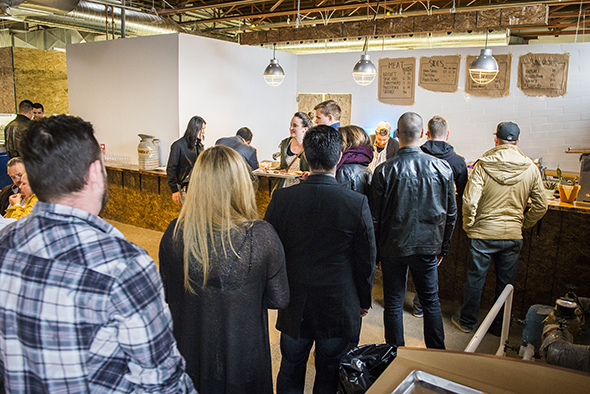 He launched it to the public back in 2013 before being swept up into the world of private catering. 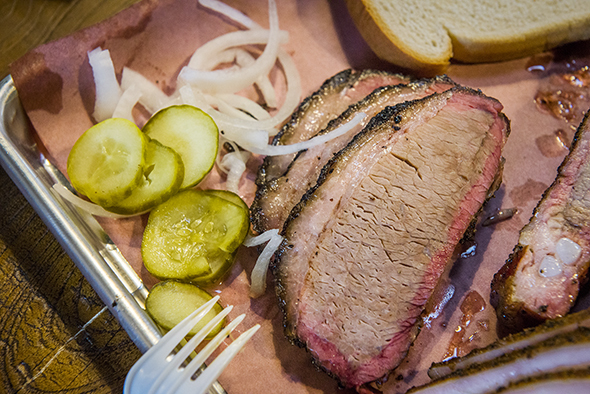 His BBQ is crave-worthy stuff done in a reverential Texas style. He distinguishes himself from Hogtown's breed of smokehouses with a 6,000 pound Oyler wood-burning smoker from Mesquite, Texas. Skelly and partner, Alison Hunt have to feed it manually to keep it going. 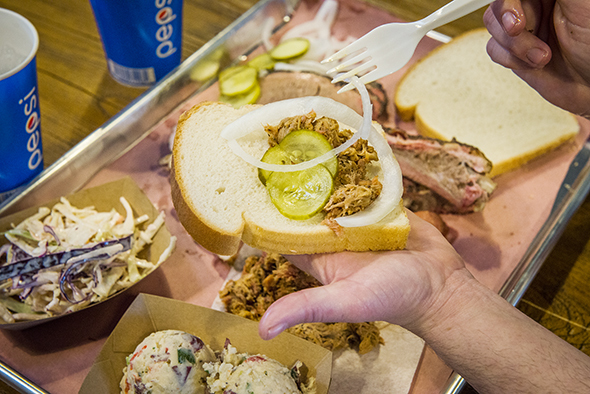 I order at the counter where simple pieces of butcher paper advertise sandwiches ($9-$11) and meats by the the quarter pound or pound with sides including slaw, potato salad and pinto beans. 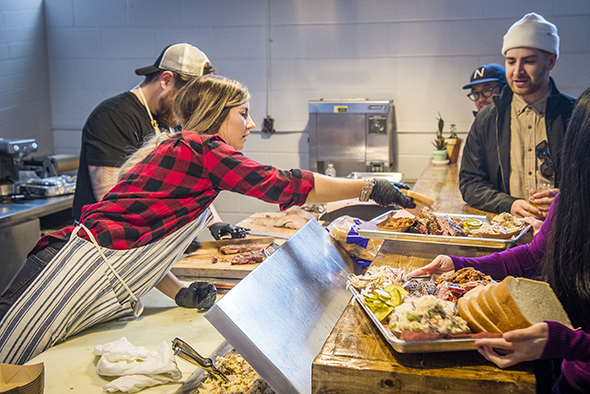 I grab a thorough sampling and watch as Adamson staff slice up brisket and turkey by hand, lob ribs off the rack with a cleaver, cut up sausages into discs and top trays with voluminous piles of pork. Trays come in a variety of sizes and are best enjoyed shared at one of the seat-yourself communal tables in the massive mess hall. 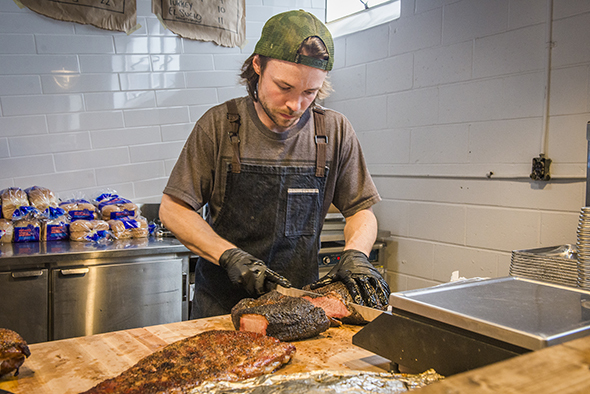 The brisket ($7/quarter lb., $22/lb.) comes encrusted in salt and spices. The bark isn't crispy; rather it's caramelized over an unctuous layer of sweet, gelatinous fat. It's impossibly tender and I can tear it apart with my hands. A cut towards the end is a little firmer, while a slice from the centre can barely hold its shape, it's like a puddle on my plate and it melts in my mouth. Big, meaty spareribs ($6/quarter lb., $18/lb. 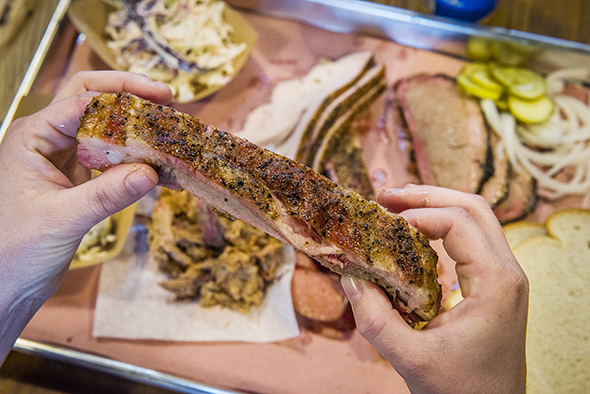 ), gristly tips and all, are dry rubbed and smoked until the meat pulls almost effortlessly from the bone. 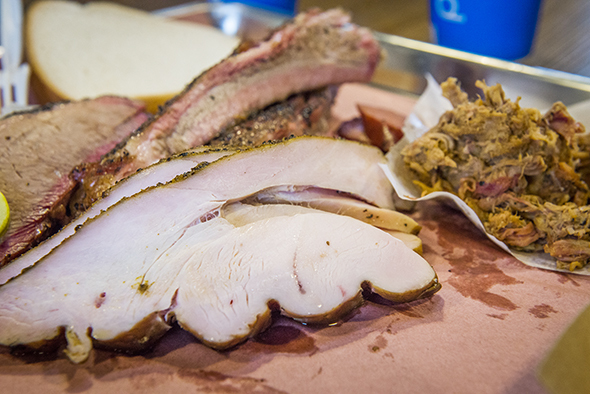 The turkey ($7/quarter lb., $22/lb.) is a surprise standout. Skelly brines his poultry for a long time and I can taste it along with the gentle flavours of sugar maple, oak and cherry wood smoke (the same that kisses all these meats). The meat is super moist and juicy, while the texture is ultra smooth and not stringy in the slightest. At my table, the succulent pulled pork ($6/quarter lb., $18/lb.) instinctively lands on a slice of white bread. It's chunky and comes with a Lexington sauce - a vinegar based dressing that adds a sweet and tangy quality to the meat. The lunch counter is open on weekdays from 11 a.m. until whenever the meat sells out. According to Skelly, 2 p.m. would be ideal, which means BBQ enthusiasts should get there early to avoid disappointment.